Take your tunes to go with this water bottle speaker. Drink in your favorite tunes with this innovative design. 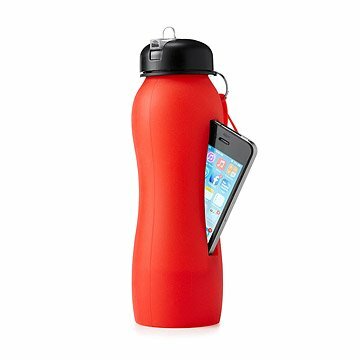 Perfect for the gym, beach, or travel, a slot for your iPhone 4 or 5 amplifies songs through the bottom of the bottle as you sip your sports drink or hydrate after a long, musical run. Made in China. Top rack dishwasher safe. Not intended for hot liquids. Avoid using cleaners containing chlorine or bleach. I got this for my fitness/sport-loving fiance because it seemed like a cool product. It amplifies the sound really well once you get the phone in there. The only issue with it is that you need to take your iPhone cover off in order to put it in. It would probably be best in an outdoor/beach setting to play some tunes and have fun. The product is great, but the place to insert the headphones should be on the side, not on the bottom. When it's on the bottom, the headphones can make the bottle stand unbalanced. Otherwise, it's great for the gym! Do not use this for iTouches. To make the electronic more secure, use a rubber band. I could never fit the lid on without it leaking. I sent it back and had to pay for the shipping, too. Still have not received my credit. I got this for my teenaged brother and he loves it. He does not have to worry about his phone at the park. All his friends find it really cool and want one. The item does work well with the phone and liquid inside. It also does a great job of hiding your phone as well. Got this as a gift from my brother in law who is a bit of a Gym rat, and he loved it! I am thinking about getting one for myself as well! Only con about this is the phone keeps slipping out, and we figured out a solution, he puts a sweatband around the bottle, it works perfectly! It definitely adds some style as well as keeping the phone in place! Love this bottle! Easy to hold while walking, treadmill, light excercising. Interesting idea. Maybe extend the idea for android phones. Great idea, but the bottle is not air or water tight. Water leaks out and a few drops can kill your phone.
" Don't judge a bottle by its cover"
Packaged perfect, and quick delivery. Great gift for athletic teens! I bought this as a birthday gift for a young teen boy and he loved it! No more worrying about his phone accidentally getting stepped on and crushed while he's playing on the basketball court with friends!